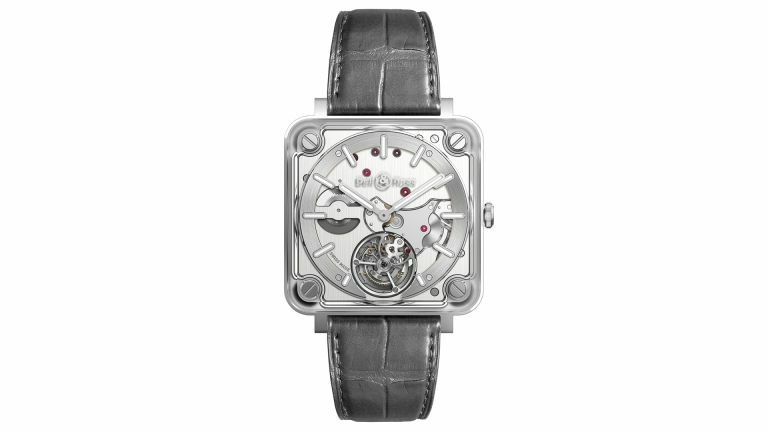 Before Apple Watch, Bell & Ross made the most famous square-shouldered watches in the world. Its aviation-influenced pieces are legendary. In recent years it's really started to push the envelope of quite how advanced and exclusive you can make a watch that's modelled on a bit of cockpit instrumentation. Latest example: version two of its 'all movement, no case', Tourbillon Sapphire piece. The BR-X2 case is 42.5mm across, in satin-polished steel, with a grey alligator strap and folding steel buckle. It's self-winding via a micro-rotor, and water-resistant down to 50 metres. Similarly, the skeleton dial and use of only two, Superluminova-filled, hands also mean the BR-CAL.380 movement is as fully visible as possible. The stripped-back approach is in contrast to the BR-X1 Tourbillon Sapphire, which perhaps over-'complicated' things (ho ho – a little horology joke, there) with chronograph dials and a reserve power meter. On the BR-X2 Tourbillon Sapphire, you can really appreciate the mechanical flickering of the flying tourbillon at 6 o'clock. The tourbillon, at least in theory, increases the precision of the time-keeping by compensating for the gravitational pull of the earth. Mainly, it is a mesmerising showcase of the watchmaker's art. And appreciate it you should, as you'll have just paid £49,900 for it, if you're one of the 99 connoisseurs lucky enough to snap one up.